This sea inlet starts at the steep coastal cliffs and leads inland to end at a deep ravine. Drayo's Cove is an ideal location for a port in the southern section of the map. It has a deep mouth coming from the sea and progressively becomes shallower allowing for the storage of many different sized sea mounts. 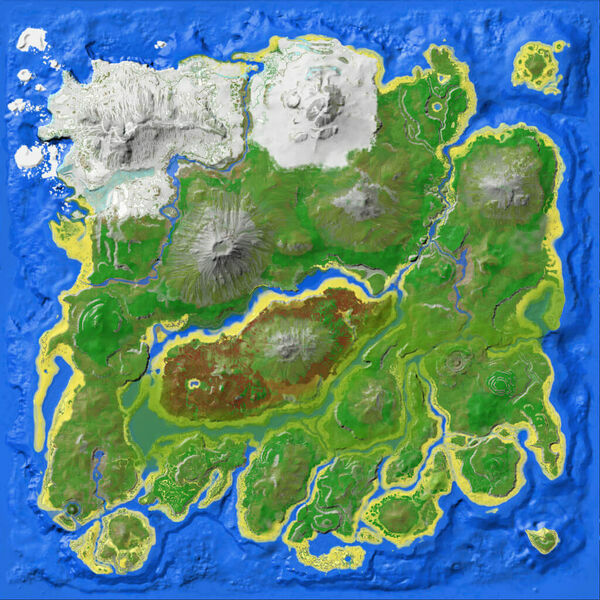 This is a known spawn for Carnos, Alpha Raptors, Therizinosaurs and rarely Alpha Carnos, so heavy fortification and base defense are recommended to safely build here. In the multiple small streams leading to the sea there are quite a few rounded river stones which have a relatively large (to normal rocks) chance of getting metal. With a metal pick you should get 1 metal per 1-2 rocks. Richer metal nodes are relatively close by to the north, west and south (Herbivore Island).